Harvest 2019 begins Sept 21! Cranberries are grown and harvested like no other crop in the world. They’re also native only to North America. That makes them a fascinating part of our heritage! Drop by and learn about this unique crop! Always the weekend after Thanksgiving! Will I see floating cranberries? You will see cranberries – lots of them! BUT, we don’t always look like the commercials. We have three ways we can harvest – dry rake, wet rake and beating. You are visiting a working farm – which means we can’t always predict what will be going on during your visit. The videos below show what harvesting often looks like here. What’s the best time to see the harvest? This is a hard question to answer. Harvesting activities are going on everyday, but remember, you’re visiting a working farm. That means we manage a lot of variables – weather, equipment, staff, farm layout, picking/packing speeds, varying fruit conditions, etc. We can’t predict exactly what you’ll see when you visit, even if you call and ask us on the day you’re planning to visit. The good new is, we do offer activities that are geared to visitors and are predictable. 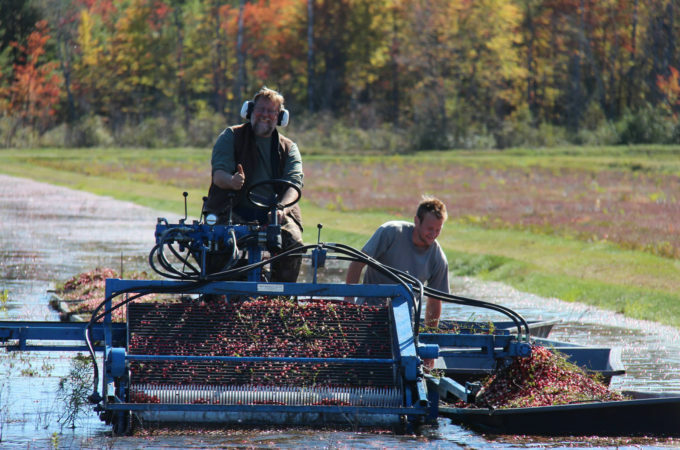 Our wagon tour is a great way to learn about all aspects of cranberry growing and harvesting. Wine tasting is always available. With a trail pass, you can see the farm via our hiking trails. Do I need hip waders? No. Places where visitors walk are not flooded. Our walkways are covered in gravel, but still, they can get muddy, and the ground can be uneven. Appropriate footwear for the weather and outdoors is highly recommended. No. There is no charge to visit the farm. You only pay for the activities you’re interested in doing. What can we do, how much does it cost, how long does it take? Check out some cool harvest footage!